Trend Lab’s Changing Pad Covers are both stylish and comfortable. The soft 100% cotton flannel cover is fully elasticized offering a sleek tailored fit to contoured changing pads. 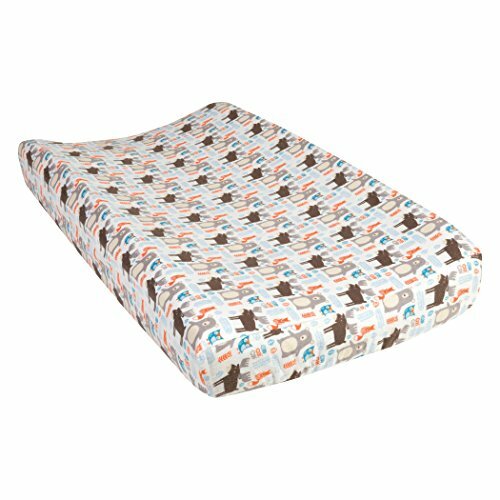 The Scandi Forest Flannel Changing Pad Cover features a bear, moose, fox, and owls print in walnut brown, blue and pops of bright orange on a white background. Cover fits a 16 in x 32 in standard changing pad. Additional colors, prints and Deluxe Flannel products from Trend Lab are sold separately. Please adhere to JPMA’s Safe Infant Bedding Practices.